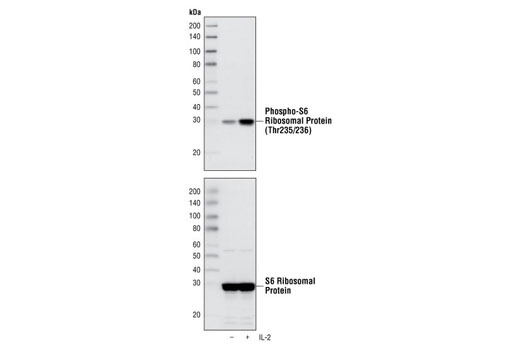 Western blot analysis of extracts from CTLL-2 cells, untreated or IL-2-stimulated (100 ng/ml for 10 min), using Phospho-S6 Ribosomal Protein (Thr235/236) (2F9) Rabbit mAb #4856 (upper) or S6 Ribosomal Protein (5G10) Rabbit mAb #2217 (lower). The human IL-2 coding cDNA was subcloned into an expression vector and expressed in E. coli. The recombinant human IL-2 protein was purified and stored in PBS buffer containing 0.1% BSA. CST recommends using 50-100 ng/ml of IL-2 for stimulation of IL-2 signaling. Interleukin-2 is supplied as a solution. It should be stored at -80°C. Aliquot the reagent unpon receipt and avoid repeated freeze-thaw cycles. Interleukin-2 (IL-2) is a T cell stimulatory cytokine best known for inducing T cell proliferation and NK cell proliferation and activation (1,2). IL-2 also promotes peripheral development of regulatory T cells (Tregs) (3,4). Conversely, IL-2 is involved in the activation-induced cell death (AICD) that is observed post T cell expansion by increasing levels of Fas on CD4+ T cells (5). The effects of IL-2 are mediated through a trimeric receptor complex consisting of IL-2Rα, IL-2Rβ, and the common gamma chain, γc (1,2). IL-2Rα binds exclusively to IL-2 with low affinity and increases the binding affinity of the whole receptor complex including IL-2Rβ and γc subunits. IL-15 also binds to IL-2Rβ (1,2). γc is used by other cytokines including IL-4, IL-7, IL-9, IL-15, and IL-21 (1,2). Binding of IL-2 initiates signaling cascades involving Jak1, Jak3, Stat5, and the PI3K/Akt pathways (1,2). Interleukin-2 (IL-2) is a type of lymphokine which Morgan et al. found in 1976 to be a specific growth factor of T lymphocytes. Interleukin 2 (IL-2) is predominantly produced by T-helper cells (TH1) having the phenotype CD4+, and by subpopulations of thymocytes after antigenic or mitogenic stimulation (1). IL-2 causes proliferation of T-cells, and its function depends on binding to IL-2 receptors (IL-2R alpha and IL-2R beta) which mediate downstream signaling including the activation of p70 S6 kinase (2). Thus, the immune response of T cells is controlled through the expression of IL-2 receptors and IL-2 binding. IL-2 receptors are expressed not only by T-cells but also by B-cells, NK cells, monocytes, thymocytes, thymic stroma cells, oligodendrocytes and endothelial cells (3). This explains the various functions of IL-2, such as immunoglobulin production, growth of certain B-cell subpopulations, macrophage-dependent cytotoxicity, growth and differentiation of oligodendrocytes and proliferation of lymphokine activated killer (LAK) cells. Abnormal production of IL-2 may lead to autoimmune diseases, immunodeficiencies and, under certain circumstances, to T-cell leukemia (4). IL-2 also shares many of these functions with other cytokines such as IL-15 (1). Nelson, B.H. (2002) Curr. Dir. Autoimmun. 5, 92-112. Tuhácková, Z. et al. (2004) Int. J. Mol. Med. 13, 601-605. Ruscetti, F.W. (1985) Year Immunol. , 100-106. Paetkau, V. (1985) Can. J. Biochem. Cell Biol. 63, 691-699.